During the beach wedding ceremony of Maxene Magalona and Rob Mananquil at the Shangri-La Boracay resort on January 11, guests were asked to come in all-white outfits. In attendance, of course, is one of Maxene’s closest friends, beauty queen Megan Young. Megan, who was also a bridesmaid, veered away from traditional flowy wedding frocks and opted for a relaxed strapless jumpsuit—gorgeous! But what we couldn’t take our eyes off, however, were her gorgeous white floral drop earrings! They were the perfect accessory to complement her jumpsuit’s tube neckline and her sleek ponytail. 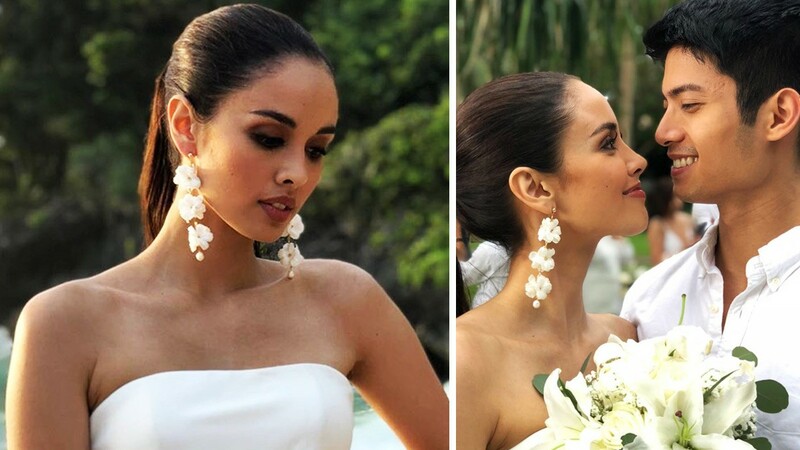 We did a bit of stalking and found out that Megan wore the Angelica earrings in Ivory from local online shop Lily Jewelry. A pair retails for P1,450. We’re totally stealing this look for the next wedding we attend!